Ginisang patola or Sautéed sponge gourd. This simple dish always reminds me of a simpler rural lifestyle when we were kids in a town far north in Luzon. Growing up, our Mami or our Lola would cook simple dishes like this. Patola are sold cheap in our town and that makes it affordable to families like us. Bits of meat, or inasinan nga taba (pork fat cured with salt), or sometimes a can of sardines, is added to make the patola dish more flavorful. Most times, Mami or Lola will just cook it as is with no additional ingredients, just sauteed and seasoned with either salt or patis (fish sauce). The simplicity of this dish cooked with love is what makes this dish delicious. It is one of our favorite vegetable dish. This days, it is one of those dishes that I often whip up specially when I am running out of ideas to cook. They are sold cheap in our part of the world, so patola is always present in our weekly grocery list. They are filling, delicious, nutritious, and friendly to my gut. This makes a great meal specially when served with either steamed or roasted fish or chicken. 1. Heat oil in a saucepan and sauté the garlic until it is aromatic and almost turned brown. Add in the onions and tomatoes and cook until they soften. 2. Throw in the patola and stir for a few minutes. 3. Add Water and season with patis, salt, and ground pepper. Bring to a boil. 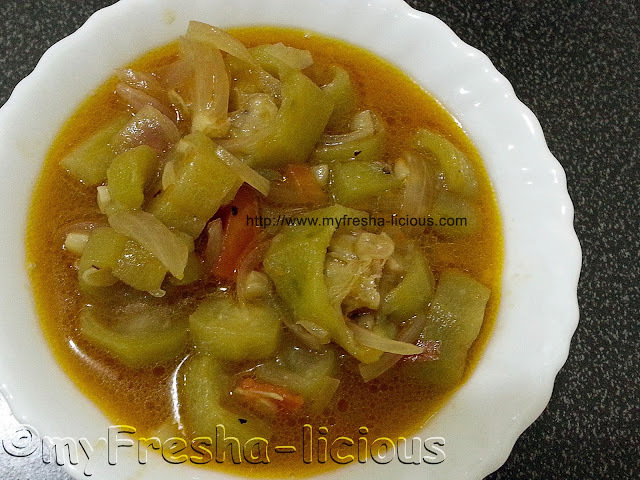 Cook the bottle gourd until its soft.